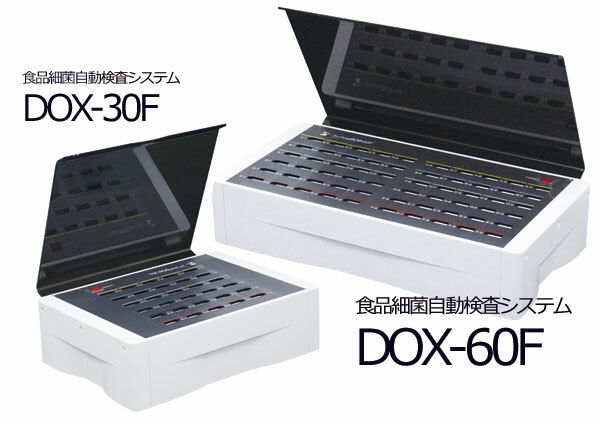 株式会社 バイオ・シータ 食品細菌迅速自動検査システム DOX (DOX-60F DOX-30F) 一般生菌/大腸菌(群)を迅速に測定 - DOX enables in-house, rapid and easy food bacteria counting! You are here: DOX enables in-house, rapid and easy food bacteria counting! DOX enables in-house, rapid and easy food bacteria counting! The most important part in food hygiene control is to prevent the adherence and the proliferation of bacteria that may cause food poisoning. A considerable amount of time, effort, and expertise are generally required to evaluate the number of bacteria in a food sample. In order to simplify and accelerate such evaluation process, Bio-Theta has produced an innovative food-testing equipment, the DOX system, which is accessible to non-specialists. Our DOX system, which test results are available quickly, gains many customer acceptances. Mar.5 Mr. Ohkawa’s 6th column has been posted.